Pregnant and postpartum HIV-positive women face a particularly complex set of barriers to prevention of mother-to-child transmission of HIV (PMTCT) uptake at the policy, health facility, community, and individual levels. They are vulnerable to poor retention in care and adherence to treatment, especially in the first three months after initiation of treatment and the postpartum period. In addition, counseling and support for primary prevention among HIV-negative pregnant women is almost non-existent in most PMTCT programs. 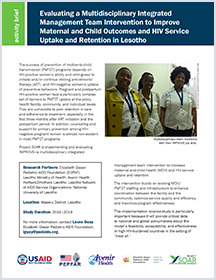 Project SOAR is implementing and evaluating IMPROVE—a multidisciplinary integrated management team intervention to increase maternal and child health and HIV service uptake and retention. This brief describes the study.